Once you start the 2014 Jaguar F-Type S convertible you can hear the ends of the highway calling your name – the genie is out of the bottle and at your command. Without even touching the accelerator, the Jaguar emitted a savage growl as it awakened from a nap in the sun. In fact, its frequent purrs and roars announce its presence long before arrival, demanding deference to its virtually royal heritage. Since it has only been available as of last May and comes with a price tag befitting its prowess, there are not a lot of Jaguar F-Type sports cars on the road as yet. This adds to the attention, finger pointing and knowing smiles a driver will notice everywhere. The F-Type S convertible is the middle sibling of the of the powerful model trio, with a 380 horsepower supercharged V6 mated to an eight-speed Quickshift transmission. Though the steering wheel has shift paddles, the transmission is smarter and quicker than most of us will ever be – it has 25 different algorithms to recognize when its expected to gently pick its way through a residential school zone or put pedal to the metal along a serpentine mountain road. It will even know if you want to drive track style or any graduation between the three. When it perceives the need for speed, it rockets forward in leaps and bounds. By the way, a smart cat protects its habitat and the 2014 Jaguar F-Type S has a aluminum monocoque rigid body shell that not only contributes to its dynamic handling, but contains considerable recycled content – up to 50 percent of the car is reused, repurposed materials. Start stop technology is employed to reduce fuel consumption – when the brake is applied for about five seconds the engine shuts down, like a jaguar perched on a rainforest limb watching the trail below. As soon as you release the brake, the cat growls and prepares to pounce. Though dedicated data gatherers probably already know this, the supercharged V6 model will do zero to 60 in 4.8 seconds with a top speed of 178 mph. Like its V8 powered sibling, it has a dynamic mode switch that engages its dark side labeled with a checkered flag. 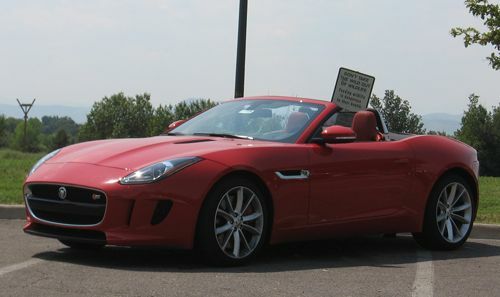 In the short test drive arranged we never found the time or place where the full force of the F-type could be unleashed, even though we crossed the Denver Metro Area several times on the freeway network, including a jaunt to Denver International Airport. It simply attains freeway speeds (and above) so easily, the boost seemed inappropriate. In a manner similar to what the controversial American music icon Ted Nugent once sang, the very British Jaguar doesn’t like to drive 65. Without actual empirical data to corroborate our suspicion, we’d guess the 2014 Jaguar F-type S convertible is most comfortable running through the country at 90 to 120 mph, stretching its muscles without straining. Being born to run requires a corresponding dedication to deceleration, so the new Jag features the largest brake rotors ever fitted on any of the brand’s vehicles, along with Super High Performance braking technology, that cuts stopping time considerably. This Jaguar is quick on its feet whether leaping off the line or avoiding an impending object – or just stopping in its tracks. The Z-folding top will pull back and store away in 12 seconds flat and will perform this trick at up to 30 mph. Another speed related feature comes in the deck mounted spoiler that deploys at 60 mph to reduce lift – it has three positions correlating to the speed driven. When stopped or moving the door handles are flush to the body – when you unlock the roadster, triangular handles pop out allowing access - very cool. So What Makes a True Sports Car? Others may suggest other criteria, but to us a true sports car needs an aesthetically pleasing appearance and exhilarating performance. It is quick as lightning, has only two seats, cutting edge technology and preferably a convertible top. Reviewing the 2014 Jaguar F-Type S V8, Dan Neil essentially stated Jaguar had outdone Porsche with its first real sports car in over 50 years. “Jag has built a car that satisfies our most refined aesthetic senses while manipulating the lowest regions of the lizard-y male mind,” Neil concluded. He’s talking about the car for those who truly want a 450-hp track car for $100K. The 2014 Jaguar F-Type S convertible is for folks who want a sports car that’s a bright joy to drive and wouldn’t be entirely out of place on the track. This model however, starts at $81K and for just over $94K has everything but rocket launchers and bullet proofing, including destination charges. For the record, one has to nearly sign life and limb away to drive off with one of these beauties for an overnight tryout. Essentially, it’s on a you-scratch-it, you-bought-it basis. Our undying thanks are due Jack TerHar and Jorge Martinez of Sill-TerHar Motors for their gracious forbearance. We used to occasionally hear the phrase, “If you’ve got it, flaunt it!” An engineer at Jaguar got on that bent 10 years ago. The 2014 Jaguar F-Type S convertible is the phenomenal embodiment of that effort. It is a sports car enthusiast’s dream come true.